This is an extra special Christmas in our house hold. Not only is it our first Christmas as a couple and in our first house together but it is Pete’s son Rhys’ first Christmas! I always think it’s better with kiddies and when my nephew and niece were born Christmas got so much more exciting for my family! We aren’t focusing on expensive Christmas presents too much this year as Rhys will only be 9 months and doesn’t understand it all yet. We’ve got him a couple of store bought things like a fireman Sam play tent, but the rest I thought I’d use a bit of DIY! As a 9 month old boy he loves noises, banging things and shaking things … obviously! So I’ve come up with this list of things to make for Rhys’ DIY Christmas presents, and here they are! 1 – DIY building blocks! I found this idea on Pinterest and am attempting to make it myself! 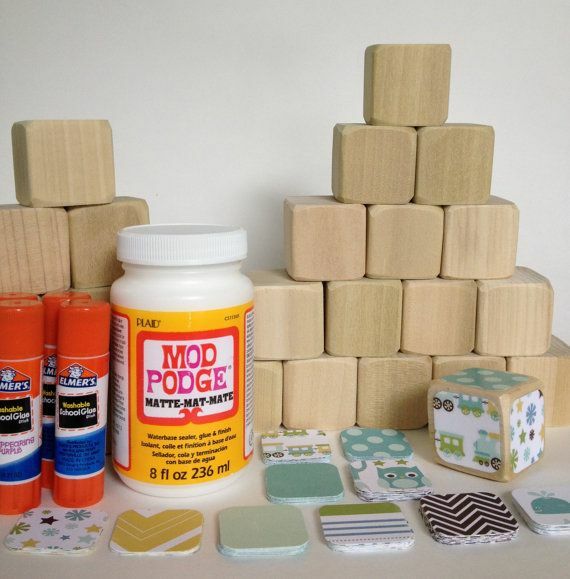 I’ve bought 10 sanded wooden blocks from a craft store that have rounded corners – safety first! I then found 8 cute patterns online, made square shapes of them on word (very techy of me) and printed 100 of each pattern. I also found some great number and alphabet stickers from a craft shop in town so that Rhys can learn while he stacks! Let’s see how it goes! 2 – Noisy shakers – These are so easy and I can’t believe that I haven’t already made 20 of these. 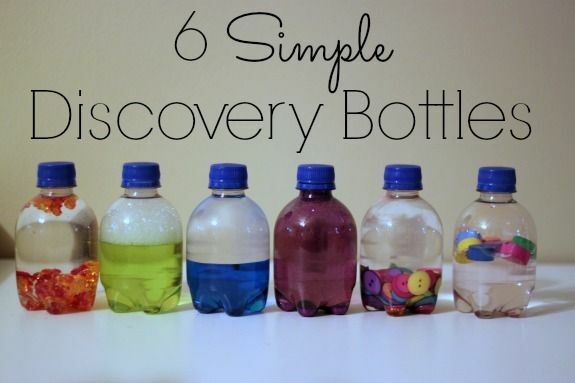 A couple of empty water bottles and anything small that can fit in through the top. 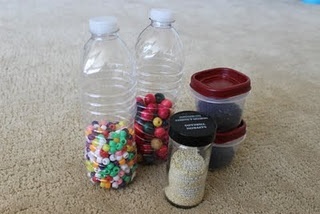 I’m going to try it with colourful beads, rice and pasta! I know he’ll love these ones, not sure how me and Pete will feel after a few hours though! 3 – Visual shakers – Rhys is really inquisitive and loves to stare at cool lights and sparkly things, He’s the first kiddy I know that will stare at the tree without trying to yank the ball balls off! (so far). Again using empty water bottles I’m going to fill them with colourful buttons and beads but in water so that they swish more that scatter. I’m also going to find some colouring and maybe even a glow stick or two to let float around in the water? Of course i’ll need to seal them thoroughly … again wish me luck! 4 – Drum roll please ……. DIY Drum! – I found this idea on a DIY Pinterest board too (getting the hint that I’m a pinner?) So I couldn’t see the instructions but I’m going to for a quality street tin! I’m going to take off the lid, punch holes around the rim, and cut out a circle of that really thick wrapping paper that doesn’t rip! I’ll then attach the paper to the tin using tie pulls on the inside, Rhys can then use his hands or any utensils to beat the drum and make lots of noises! This is all in the process so bear with me during my crafty DIY pre-Christmas week and i’ll be adding pictures as I go!